Zoe Laboure was born at Fain-lès-Moutiers, Burgundy, France to the farmer Pierre Labouré and Louise Laboure as the ninth of eleven children on May 2, 1806. From an early age felt a call to the religious life. When Catherine was nine years old, her saintly mother died on October 9, 1815. After the burial service, little Catherine retired to her room, stood on a chair, took our Lady's statue from the wall, kissed it, and said: "Now, dear Lady, you are to be my mother." On January 25, 1818, Catherine made her First Communion. One day she had a dream in which a priest said to her: "My daughter, you may flee me now, but one day you will to come to me. Do not forget that God has plans for you." Sometime later, while visiting a hospital of the Daughters of Charity at Chatillon-sur-Seine, she noticed a priest's picture on the wall. She asked a sister who he might be, and was told: "Our Holy Founder Saint Vincent de Paul." This was the same priest Catherine had seen in the dream. Catherine knew she was in the right place. Later, on January 1830, Catherine began her postulancy at Chatillon. On Wednesday, April 21, 1830, Catherine Labouré entered the novitiate of the Daughters of Charity, located at their motherhouse, Rue du Bac 140, Paris. taking the name Catherine. On the eve of the Feast of Saint Vincent de Paul, July 19, the Sister Superior spoke to the novices about the virtues of their Holy Founder and gave each of the novices a piece of cloth from the holy founder's surplice. Because of her extreme love, Catherine split her piece down the middle, swallowing half and placing the rest in her prayer book. She earnestly prayed to Saint Vincent that she might, with her own eyes, see the Mother of God. who ask with confidence and fervour. they will be given to the rich and to the poor"
It is 5.30pm, and the Sisters are in the chapel for the hour of Meditation. Suddenly Catherine Laboure hears, to her right, the same rustle as before; it is the Blessed Virgin Mary. She stops to the left near the painting of St. Joseph. This whole apparition is conducted in scenes and sign-language. The Blessed Virgin "standing in space". She was dressed in white, standing on a globe and holding a golden ball, with rings on her fingers flashing with light. An inner voice told her that the ball represented the whole world and that the rays coming from Mary's fingers represented graces for individuals. Then, a second phase: The golden ball then vanished as this apparition changed to represent Mary with her arms outstretched, inside an oval frame with golden lettering:"O Mary, conceived without sin, pray for us who have recourse to you." This was the front side of the medal that was to be made." Mary gave her this instruction: "have a medal struck on this model. All those who carry this will receive Grace in abundance, especially if they wear the medal around their neck and say this prayer confidently, they will receive special protection from the Mother of God and abundant graces". Then it is although the whole scene turns around and Catherine Laboure can see the back of the medal: in the centre is the letter M, from where a Cross ascends with at its base a cross-beam which passes through the letter M and below this the two hearts of Jesus and Mary, one crowned with thorns the other pierced by the sword of sorrow. The whole is surrounded with a crown of 12 stars recalling the vision of St. John in the twelfth chapter of the Apocalypse or Book of Revelation. Catherine Laboure hears: "the M with the Cross and the two hearts say enough". Catherine Laboure died on 31st December 1876. When her body was exhumed, after fifty-seven years of burial, it was found to be completely incorrupt and supple. Her eyes were as blue as the day she died. On 28th May, 1933 she was beatified by Pope Pius XI. This occasion was witnessed by 50,000 people, of which there were 8,000 children of Mary, veiled in white, all wearing the Miraculous Medal. 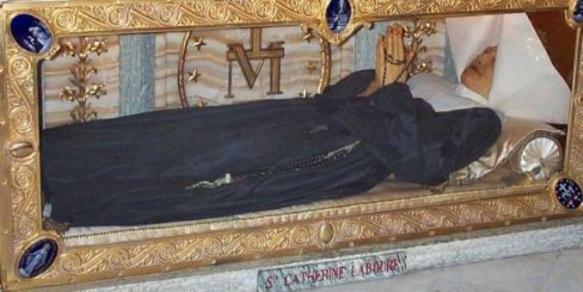 On 27th July, 1947 Catherine Laboure was canonized by Pope Pius XII. Here again many believers were present, including more than 10,000 children of Mary, veiled in white. Many healings, including those of people for whom there was totally no hope, were attributed to the "Miraculous Medal". Just in the American city of Philadelphia alone, between 1930 and 1950, more than 750.000 favours were granted and registered. Catherine Laboure is still lying in state at the right of the altar in the chapel Rue du Bac 140, in Paris and she still looks as though she only died yesterday! Patroness of architects, miners, and prisoners. "These apparitions of Mary and the Miraculous Medal by Catherine Laboure are fully approved by the Holy See: 1836"